How many times have your forgotten your tomatoes in your vegetable drawer? Perhaps, you are going on vacation and don’t know what to do with your unused veggies? No one like to throw away spoiled or soon to be spoiled vegetables. Talk about hard cash going down the drain. Recently, I faced this same situation with an abundance of tomatoes and upcoming vacation. I took a cue from last year’s harvest and froze the tomatoes. Read on and add your tips too. 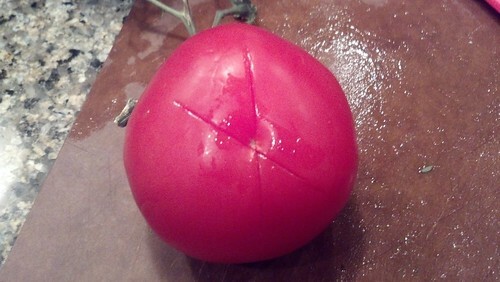 Tomatoes have such a short shelf life, and when they go bad, it isn’t pretty. I can’t tell you how many times I had to clean out my vegetable drawer from tomato water. This time I wasn’t going to lose those tomatoes. Put them on a cookie sheet in the freezer for 24 hours. 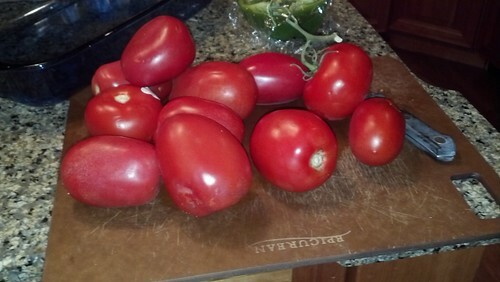 When I make homemade just harvested tomato sauce, I freeze the tomatoes first since it is easier to take off the skins. (See how I make fresh tomato sauce with my tomato press.) Then I put them in old spaghetti containers to use when a recipe calls for canned tomatoes. When you defrost the jars, simply peel off the skins. It is really easy. Remember, to reuse the skins for making vegetable stock. Be sure to read the comments on the veggie stock recipe. The suggestions were wonderful ways to enhance the stock. How do you save your tomatoes from going bad? Is clearing out your refrigerator the pits? Have a handy tip on how to use up an abundance of tomatoes? We don’t have the best of tomatoes in Norway, so I actually never buy too much of them but in the rare occasions when they are about to spoil I turn them to tomato juice and drink up! When you freeze them they are like tomatoes you use in dishes. I used some the other day and hands down, better than canned. I love the tomato juice idea. Do you have a favorite recipe? Anna, it’s nothing special – just raw tomato juice with crumbled feta cheese and just a sprinkle of salt but it is delicious! Yup! I agree. I put tomatoes in the fridge too, to avoid spoilage. Thanks for posting. I didn’t know you could freeze them and reuse them. Thanks Anna. I normally only eat tomatoes when making a sauce out of them and I prefer fresh to canned. At least I will be able to store the ones I don’t use. I appreciate your comments on saving unused tomatoes, but one thing I wanted to share is that fresh tomatoes should NEVER be refrigerated, unless they have been cut open. Fresh tomatoes refrigerated causes them to get mushy. Any worthwhile produce store/vendor will tell you the same. I leave mine on the kitchen counter until I use them. Another thing is that tomatoes continue to acquire more nutrients after being picked and get sweeter. What do you do with them when they start to go soft? Do you cook them, freeze them, etc? ehm still unclear on how to remove the skin of the tomatoes. Wouldnt it be eaesier to use hot water? Here in GT we use coal heat up when doing bbq’s to cook them well. Burns it off quite good. Any ideas welcome. You can also put them in the freezer for 24 hours skin and all. When you need to use them simply defrost and peel off the skins. Never done that before but I will surely try this one out. My tomatoes are bearing fruit right now. Surely there will be more to be put in the fridge. Sometimes I saute them in olive oil with garlic and put them in a jar and put them in a refrigerator. I saute tomatoes,basil and garlic, then freeze in small baggies until ready to use . How long do they last? Can you freeze them for say a week or so? Ive been looking into planned cooking for my weeks lunches in order to save water on washing dishes. I have had my tomatoes in glass jars for some time. Over a year.